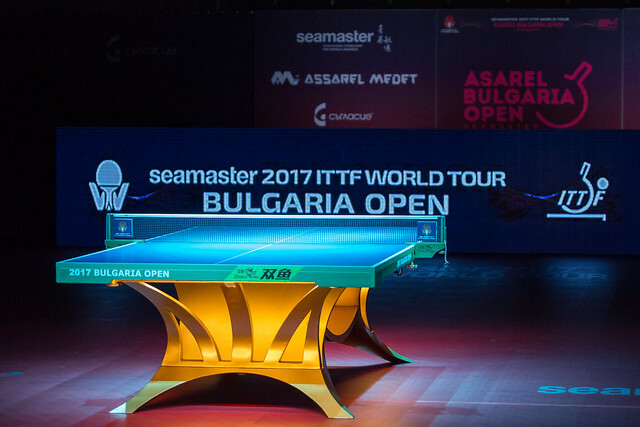 The morning session of play on Thursday 17th August at the Seamaster 2017 ITTF World Tour Asarel Bulgaria Open hosted Men's Doubles action, as 16 pairs battled it out in the hunt for quarter-finals positions. Teodor Alexandrov and Denislav Kodjabashev gave the home crowd a good reason to cheer after the eighth seeds successfully negotiated their opening Men’s Doubles contest. Russia’s Viacheslav Burov and Kirill Skachkov provided the opposition in what was expected to be a difficult encounter for the Bulgarian duo, but a confident display from Teodor Alexandrov and Denislav Kodjabashev followed ensuring the host nation’s representation in the last eight (6-11, 7-11, 12-14). There was more Russian disappointment at the very bottom of the draw as Alexey Liventsov and Mikhail Paikov had their title defence campaign cut short. Crowned champions last year at the tournament in Panagyurishte Alexey Liventsov and Mikhail Paikov were anticipated to be major silverware contenders in the category once again, but a wonderful effort saw Chinese Taipei’s Lin Yun-Ju and Yang Heng-Wei recover from two games down to beat the Russian pairing (6-11, 8-11, 11-6, 11-8, 15-13). India enjoyed a strong outing in the Round of 16 as two of the country’s partnerships progressed from the stage. Soumyajit Ghosh and Sathiyan Gnanasekaran proved too strong for Belarusian opponents Kiryl Barabonov and Pavel Platonov (11-0, 11-9, 11-6), while the fourth seeded duo Amalraj Anthony and Sanil Shetty held off the challenge of Ibrahim Gunduz and Abdullah Yigenler (11-6, 11-6, 5-11, 8-11, 11-6) as the Turkish representatives exited the competition. The semi-finals of the Men’s Doubles tournament will feature a Japanese partnership after the first and seventh seeded teams won their respective matches to book an all-Japanese fixture in the last eight. Coming through the Round of 16 relatively untroubled Jin Ueda and Maharu Yoshimura comfortable saw off Harmeet Desai and Arjun Ghosh by a three games to nil scoreline (11-5, 11-3, 11-4), setting up an encounter with Yuto Kizukuri and Kenta Matsudaira following their four games triumph over Viktor Brodd and Hampus Nordberg (11-5, 7-11, 11-8, 11-2).